Reviewed by Tor Johnsen and Susanne K. Koch. When planning our trip to Gothenburg, our eyes fell on a restaurant awarded one star in the prestigious Michelin guide. When browsing its website and exploring their smaksmeny, or "menu de dégustation" as the French would call it, we grew determined to try it. At a price of SEK 1150 (EUR 105), wines included, it sounded too good to be true. Our meal at Fond was way past the average, but in no way perfect. We walked down Kungsportsavenyn, in our quest for the Fond Restaurang. We ended up at its end, still confused, and had to ask for directions. When asked, it was obvious that they knew of the place, and we were directed towards a small round building connected to a Mastodont of a building. Be not confused, dear reader. 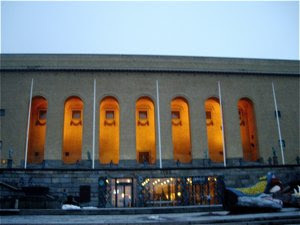 In spite of the fact that Gothenburg has close to a million inhabitants, the distance travelled was a mere 15-20 minutes. The area, though, is not of the most charming. It is to remember that the city is young, only 4 centuries, and the city centre has undergone large transformations. 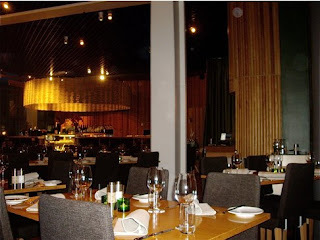 Visiting Fond Restaurang, you easily recognize good service. We LOVED being guests. We were faced with a a staff that were determined to make our meal memorable. This was done in our presence, but as I observed the staff waiting on our neighbouring table, I discovered that it was more to it than that. They taste the wine, themselves, before offering it to their guests to taste, then they poured it into a glass decanter. There were at least one, but often two or even three waiters, that oversaw that everything was to our needs. Preparing to write this review, we were, in all friendliness, of course, demanding customers. We asked questions, and our terrific waiter answered them there or then, or visited the kitchen to get information. Fond Restaurang deserves its star for its service alone. Fond Restaurang is dedicated to Scandinavian Nouvelle cuisine, mainly based on locally produced ingredients and inspired by local traditions. This theme is easy to spot when entering. 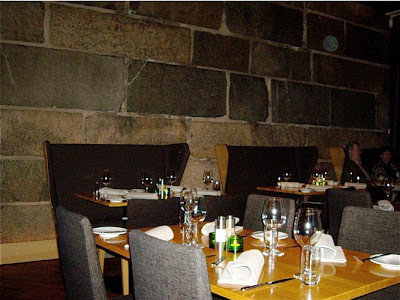 The wall of the adjoining building, large dark stones, make up the back wall of the restaurant. The use of materials underlines the Scandinavian inspiration: natural fabrics, birch wood, and chrome. We were placed at a table by the large curved window. It was beautifully set with wine glasses, napkins in light fabric, modern Scandinavian china and designer cutlery. Good distance to our next table. As you see, dear reader, Fond does not achieve a full score when it comes to atmosphere. We found the interior to be a little cold, as many designer restaurants tend to be. In addition to this, we found the table too small for the two of us. We were served on plates that took up much of the table top, and we were left with too little space to feel comfortable. One thing that separates the extraordinary from the ordinary restaurants is the amount of extras. We were served a small cup of celery soup as a pre-dinner dish. 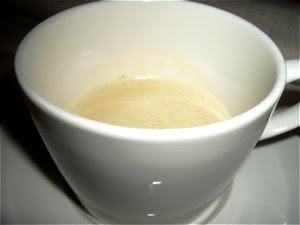 A light, nearly caffe-latte coloured soup served in a simple white cup. 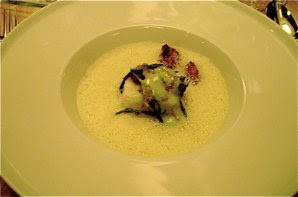 It was an exquisite starter, deliciously creamy consistency, perfectly balanced seasoning, and enough to act as a mere taste, made from good stock, the semi-sweetness of the celery was perfectly balanced with salt and bitterness. This would have been too pungent, if served in larger quantities, but as a taste, it was delicious. At this point I discovered I was relieved to see the quantity. We were to enjoy 7+1 dishes with wine. The two varieties of salmon were presented to us on a long white plate. A small slice of each served on a bed of salad, one garnished with a thin slice of radish. Delicious texture, tender, fat salmon on very crispy salad. Well balanced, but taste of the two varieties were not easy to desinguish. In spite of the fresh dill mustard, we had expected a little more taste. This was clearly one of the highlights of the evening and clear hit. The terrine was exceptionally smooth and creamy, and the contrast to the crispy caramel and the waxy structure of the cinnamon flavoured apple was as close to perfection as possible. 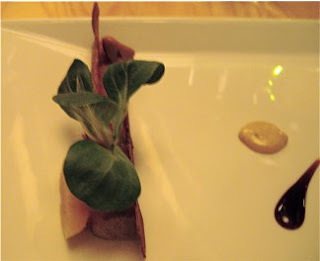 Even the balance of the tastes had ascended to a divine state, a very aromatic and perfectly seasoned terrine, and two apple flavors one intensely sweet, the other slightly bitter from the cinnamon. This dish explains why Fond Restaurang has achieved on star in the prestigious Guide Michelin. This was the only dish that did not meet our expectations at all. One piece of codfish in an oyster and mussel stock garnished with crispy breaded scallops and shrimps and lightly boiled samphire. Presentation - a circular piece of fish, immersed in a froth. Texture: Perfectly prepared fish, delicate airy broth, crunchy samphire, the prawns and scallops were a little soggy. We were concerned when we tasted this dish. Something had gone slightly wrong, as both the fish and the broth were salt, very salt. It overpowered the other taste elements found in the ingredients. We both agreed that either the fish or the stock could have been salt, and the other should have been balanced either by a slightly sweet or a sour taste, e.g. lime or lemon. 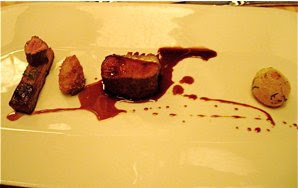 The fifth dish did confirm Fond as a high-class restaurant .We were served one slice rack of lamb with a lamb sweetbread, and glazed echalotte presented on one long designer plate. Delicious in texture, the lamb was perfectly prepared and sensationally tender and accompanied by rich potato fondant with a dense structure and slightly crunchy onion. I had never tasted sweetbreads before. It had been breaded and fried, crunchy on the outside, with slightly tough and rubbery texture. The dish was perfectly balanced, sweet, sour and salt in harmony, and all tastes blended into a higher union. A piéce de resistance - parfait!!! Two delicious slices of cheese from Wilhelmsdals Gårdsmejeri. This is a small dairy located close to the city Simrishamn in Skåne county in Southern Sweden. The cheese was served on an elegant white plate - with jam and two crisp bread with goat's butter. Aromatic artisan cheese was well balanced by pungent sweetness. A perfect end of the savoury part of the meal. 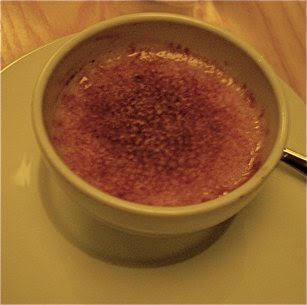 Our first dessert - creme brulée, with a caramelized lid is a classicm but in the company of o many great dishes, we found this dessert a little boring. It was served in a white bowl. The lid had a lovely crunch and and underneath you find a pale creamy custard. All in all, we found the taste of the custard a little bland. We were at the end of our meal, or nearly, as we were served our second dessert. On a base of a "biscuit", an apple sorbet with a flake of caramelized sugar. Beautiful presentation: The base of the dish - the rich, sweet hazel nut brown butter biscuit was quite tough, and it was in fact, an effort to try to cut into it. 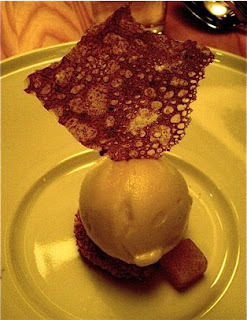 The taste was good and balanced, the sorbet was delicious, and a great contrast to the very sweet caramel and the cake. 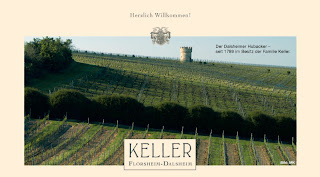 This is a wine produced by Weingut Keller, an estate in Flörsheim- Dalsheim in Rheinhessen that has belonged to the Keller family from 1789. It is made from 100% Riesling grapes. It was an eminent wine, in all ways very suitable to the dishes it was served to. A well balanced wine with a great mineral touch and complex fruit characters of citrus, peach and flowers. This wine is produced by the fabulous Mas Belle Eaux les Coteaux. The owners of Quinta do Noval and Chateau Pichon-Baron has created a wine , that even the wine guru Robert Parker has awarded a stunning 91/100. It is a blend of Syrah (70%), Grenache (20%), and Mouvedre grapes (10%). This was a wine with an amazing body. It had rich aromas of black fruit and spices. It was a wine that was extremely well chosen to our food. This wine is produced under the Graham's brand - owned by the Symington family. It is a blend of the following port grapes: Touriga Nacional, Touriga Francesca, Tinta Oriz, Tinta Barroca and Tinto Cao. Deep and almost opaque ruby colour. and an intense nose of red and black fruit aromas. It is a full bodied and robust wine leading to a complex and fruit-driven finish. In spite of this, it did not make us ecstatic. I personally, am not a great fan of ports, and it followed two amazingly good wines, so I suppose it had a drawback as well. I love the sweet wines from Sauternes, and I lived too long with the illusion that the wine growers in this region were the only that could produce sweet wine of such an outstanding quality. The 2005 Château Rondillon originates from the commune of Loupiac in the Departement Gironde. It was a rich dessert wine with intense sweet aromas of tropical fruits, peaches, and honey. Fond is a restaurant that deserves its Michelin star for a creative and interesting menu, excellent service, and elegant interior. We had a great meal at at very decent price, but found that the cooks did not manage to keep the same high quality and finesse through the whole menu. The over salted cod and the tough base of the hazel nut brown butter cream and apple did effect our total score. But Enjoy Food & Travel totally enjoyed the evening, and would like to thank the professional staff for the best service ever. We highly recommend a visit to Fond Restaurang, and the tasting menu and small wine menu at €105 is a bargain.